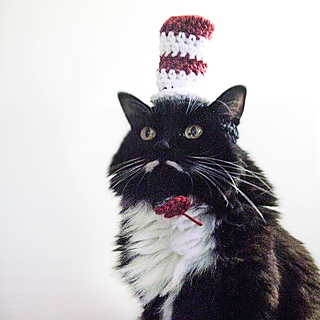 This crocheted cat hat is a great cat costume or prop for some Dr. Suess inspired photography! 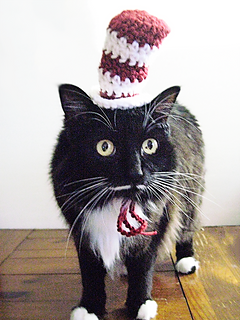 It’s sized for an average adult cat head (roughly 2” - 3” between their ears on the top of their head). 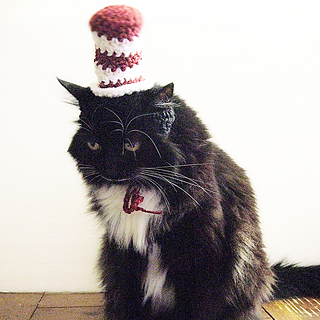 This hat will fit small dogs who have similar head sizes to cats, as well. 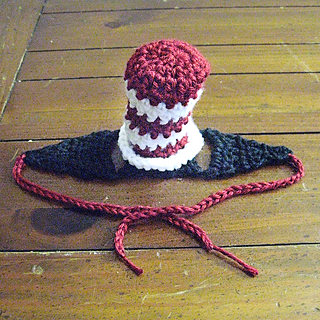 The red ties on this particular hat are so the cat can be wearing a bow tie while wearing the hat, all in one piece! Pattern is written in US terms and includes sizing pointers along the way to adjust fit and make sure you’re on track. 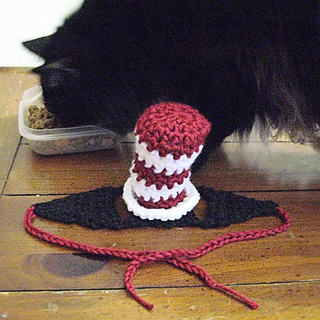 This Cat Hat is sized for a between ear width of about 2” (5 cm). It can be adjusted easily to fit wider heads – make sure to increase the tie length too. Please remember these are supervised wear only items - pets should not be left unattended wearing them.